1. 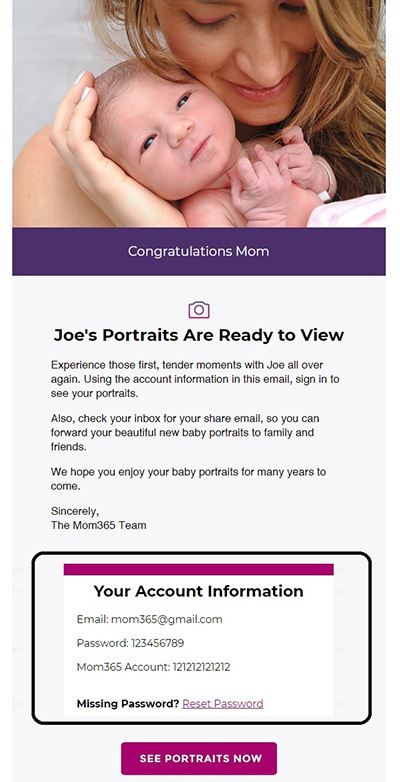 If you have your email and password information, you can sign in to view your portraits, you will be directed to your baby's portraits after signing in. - click here to sign in. Your email address is the same email that you provided to your photographer and your password was provided to you in your Welcome Email. You can find the details in the Welcome Email as indicated below. Also please check your email spam or filters for the sender address: mom365@mom365mail.com. 2. If you have changed or forgotten your password, you can request it here. 3. If you did not provide your photographer with an email address in hospital, you can locate your account here. 4. If you are still having issues you can contact customer service here.